Following last week’s interview with Nitisha about her work in the Special Collections archives, this week Whitney talks to her about her first role in conservation here at MERL. 1. What made you get involved with conservation? I started volunteering with Fred the Conservator here in the Conservation studio because I wanted to explore conservation. I had never heard about this field before because my background is in Law. I started by volunteering and then when the HLF funded redevelopment project started, I was hired on a short-term contract to work alongside Kate Gill, a specialist Textile Conservator, on the two Michael O’Connell’s wall hangings to help conserve them for the new re-display. Later my contract was then extended to work alongside Fred on the collections for the re-display. This was possible because of the considerable volunteering hands-on / practical experience I had by then. 2. What does conservation entail? It’s basically taking care of the heritage and specifically here in the museum looking after the collections and the objects. So it’s very hands on, very practical work. For example if you have a mug and the handle is broken you have to repair it but at the same time not change it. There is a difference between restoration and conservation. 3. What aspects of conservation interest you the most? I really like working with the objects and being able to make a difference with my hands. It’s really rewarding when you can make a difference to something that would just otherwise rot away, but instead you are able to preserve it and make it accessible to the public and future generations. 4. You highlighted the difference between restoration and conservation earlier. How would you describe the difference to someone that doesn’t have much idea about it? With conservation you try to repair the object but maintain its totality whereas with restoration you would perhaps change it to make it look better and improve its aesthetic appearance. 5. What things helped you become more comfortable in being able to handle objects? I worked alongside Fred the Conservator and started to understand why certain things can and cannot be done. I also did a Chemistry for Conservatory course because I wanted to understand the science and the reasoning behind it. 6. What other significant details are important when working with objects? 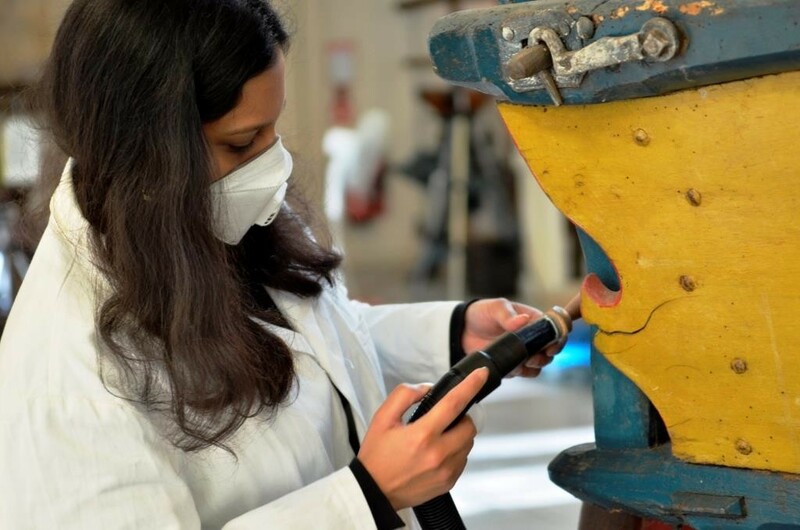 You need to understand what the need is for the repairs that are going to be carried out, the material of the object, how it was made and its purpose. Is it for a private client or a museum piece? If it’s for a private client the client may not want you to change the look or they may want you to change it so it looks brand new. But from an ethical point of view conservation is preferred rather than restoration because you are not changing the object only preserving what is there and giving it a longer life. Whitney: So it seems that it’s all about the intended purpose surrounding why you are handling a particular object. Nitisha: Yes exactly, because objects have historical value and may not necessarily have monetary value. Although they can also have both. We also have to question whether it’s the only one we have left in the world. 6. What advice do you have for the next generation of individuals that will go on to work in museums, heritage sectors or fields that encourage the preservation of culture and history? Don’t limit yourself to thinking that you are not capable of doing something. Give yourself all the chances and take up opportunities. Try volunteering, be open to suggestions and have a good relationship with the professionals. If you understand what you want then it becomes easier for other people to guide you. I currently find myself at a stage where I’m still exploring. Though I don’t know what the final destination will be I’m just enjoying the journey. Lady Evelyn Balfour was born on the 16th July 1898. After studying agriculture at Reading University she went on to write The Living Soil and then co-founded The Soil Association in 1945. She was also a main person behind the organic farming movement, which provided more jobs for women compared to the only 5% of women working in chemical farming. Born almost exactly 100 years after Lady Eve, we are both female, feminist and consumers of organic food, you can see how Lady Eve Balfour appealed directly to both of us, and why we are thrilled to be able to delve more into the life and the legacy behind one of the most influential people and women for agriculture in the early 1900’s. Eve Balfour was born into a large and influential family (Fun Fact: Her Uncle Arthur was appointed as Chief Secretary of Ireland by his uncle Robert which is where the phrase ‘Bob’s your uncle’ originates). As a child she travelled between two estates with two different types of soil, one of which was bright red, which may have been the start of fascination with farming and soil. Eve’s family were keen to educate their children well, and one of the many things she was taught as a child is how to make and support a convincing argument. She was also seen as very determined as well as amusing (Fun Fact: One Christmas as a young girl Eve burst into the servants Christmas Dinner to sing them a song). At 12 years old Eve decided she wanted to become a farmer and was educated accordingly and accepted into the Agriculture College in Reading,despite her and her entire family’s awful spelling (Fun Fact: Eve’s brother, and heir to the Balfour estate Arthur Robert Lytton was probably dyslexic, he wanted to go into the Navy but despite passing the medical he failed the entrance exam by spelling his own name wrong (Robart)). Eve thoroughly enjoyed university and even spent a year on a farm. She planned to open a farm with her sister, Mary. In 1919 Eve aged 21 finally bought her own farm in Haughley, Sussex with her inheritance. The reason why Lady Eve Balfour is important is because after she spent a year in farm, she took part in an experiment called the Haughley experiment where she proved the link between the quality of soil and our health. Before there had been scientists such as McCarrison who had made the link between health and diet and other scientists such as Harrison made a link between the quality of food and the quality of soil. The results were published around February 1940 and were highly respected by important institutes. After this she was able to set up the Soil Association in 1945 and has in this way affected farming significantly today. Although her discovery may seem very boring and pointless, it meant that farmers knew how to improve the quality of their produce and has improved the health of many people since then. Even though few people may know about her she has truly impacted all of our lives today. 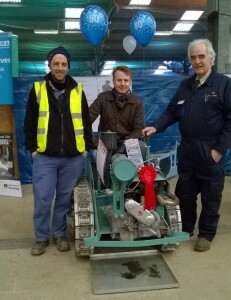 Jonathan Cox, Anthony Brennan and Adam Lines pictured with the earliest MG crawler on display and the trophy for the best in show. MERL was invited to the Spring Tractor World Show which took place weekend by the group creating the 80th anniversary display of Ransomes MG crawlers and implements. The display, formed of around 35 Ransomes, won best in show! 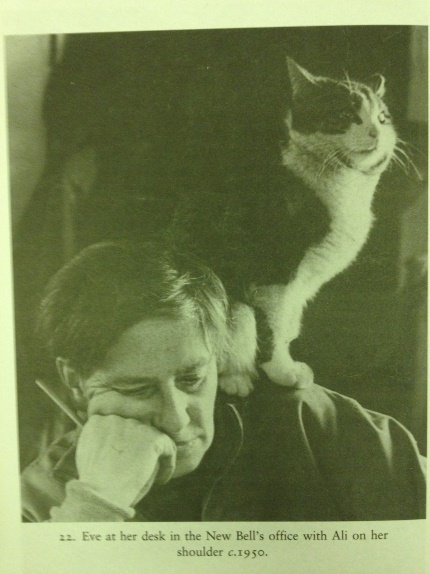 MERL was keen to attend to promote the archives that are held at the Museum. 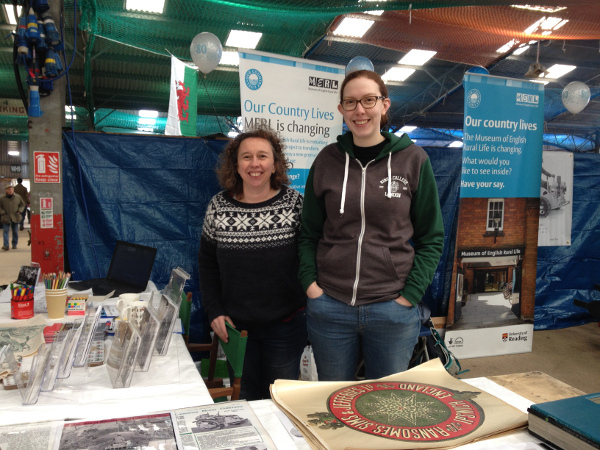 Our stand included two Ransomes films: A 1951 promotional film of the MG5 in use throughout the year and a second film entitled Speed the Plough (A day at the Plough Works) dated 1952. The films created a phenomenal amount of interest. The Museum holds at least 100 Ransomes films in its collection. We also took examples of trade literature, drawings, photographs and catalogues from some of the other collections we hold at the museum including: David Brown, International Harvester, Massey Ferguson, and Charles Burrell. We had many conversations about other related collections of steam manufactures held in the Museum archives: John Fowler of Leeds, Wallis and Steevens, Clayton and Shuttleworth, and Marshall Sons and Co.
We spoke to over 230 people over the two days and were thrilled to meet so many people who had contacted us in the past for information and were keen to visit the museum when it reopens in October 2016. Keep checking the website for further details. The Tractor World Show was held at the Three Counties Showground, Malvern, Worcestershire, 27-28 February 2016. 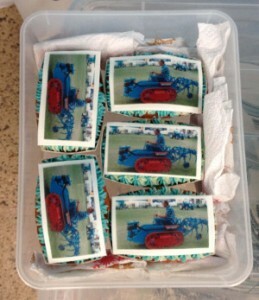 The stands also included a display to commemorate the 50th anniversary of the Ferguson T 20 tractor and Zetor tractors. Many thanks to Jen Glanville, Caroline Benson, Jonathan and Patricia Brown, Felicity McWilliams and Adam Lines for attending the show and for Anne who made the MG crawler cakes!